I can’t get enough of all the new pictures of our new Champs, finalists, and cast celebrating their wins and time on Dancing With The Stars this season. 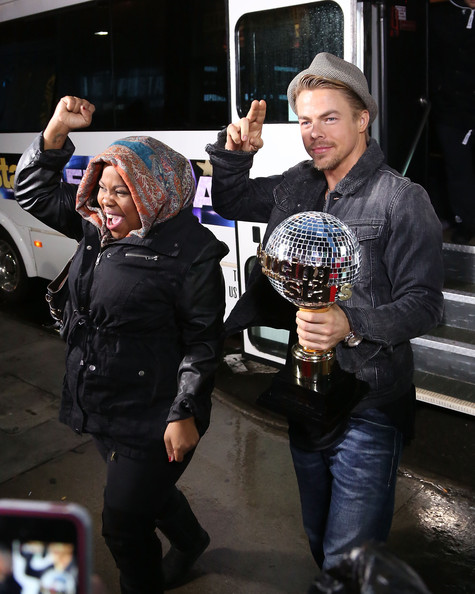 Pictured above is Amber Riley and Derek Hough in New York City heading to Good Morning America. You can view more takes of them and the other finalists at Zimbio Pictures and Getty Images. Getty Images also has more Dancing With The Stars Wrap Party pictures than what we showed you in an earlier previous posting. Also, don’t miss heading over to Pure Derek Hough for more coverage with Amber Riley and Derek Hough. Heidi and I are pacing ourselves trying to get everything up and for International viewers as well. Carrie Ann Inaba has written her new and final blog of the season at Parade.com. She starts off saying that “the best dancer won”. Below is more including her thoughts on all the finalists. Well, the best dancer won!!!! I know this season was very unique in that no one really knew how the audience was ultimately going to vote. With the Bill Engvall Phenom, it was hard to say how things were going to turn out since we had shocking elimination after shocking elimination this season. But in the end, I would definitely say that the best dancer won. Amber Riley had a special kind of dancing Mojo. I was so surprised to see how emotional she was in her final package. After Amber won, she came right over and thanked the judges. In all 17 seasons, that’s never happened! She was so happy and thrilled to have won and thanked us for our comments throughout the season. That was a treat for us. 🙂 It’s nice to be thanked! What I love about Amber is that she really let herself become vulnerable during the season. In life, we go through a lot of it with feigned confidence and faux strength. I see more and more in life that people don’t allow things into their hearts and risk hurt through failure or disappointment. But in life, it is truly the case that if you don’t risk, you don’t gain. I was impressed with the amount of emotion that came flooding out of Amber in that final video package before they announced the winner. You could see that she opened her heart to this whole experience and she really let it move her. Actually, I think that was the case for most of our performers this season. This was a beautiful season with a fantastic ending. The freestyles on night one of the finals were incredible. I haven’t seen such wonderfully produced and performed production numbers in a long time. The Amber Riley Stomp and shoot-out fest was cool and slick and powerful and ever so well rehearsed. They were tighter than tight!!!! And it was a first that frat stomping was used in a freestyle. And then, Jack’s incredible Old School Hollywood Ending was touching and glamorous and felt like the picture-perfect ending to a wonderful story that was Jack’s story. His incredible strength is to be admired. I suffer as well from a few Auto-Immune conditions that make life challenging at times but you have to (ask Jack always says) Go Big or Go Home, which is exactly what he did. He went big and he never gave up. And, he didn’t use his illness as a crutch for sympathy which made his journey even that much more respectable. Lots more at Parade.com. I loved when she called Derek Hough a “mastermind choreographer” and that he is. Also, be sure to see E Online as well. They have a new feature posted about Carrie Anne’s finale dress and how it came to be. She looked beautiful, didn’t she?! So classy! I loved it. 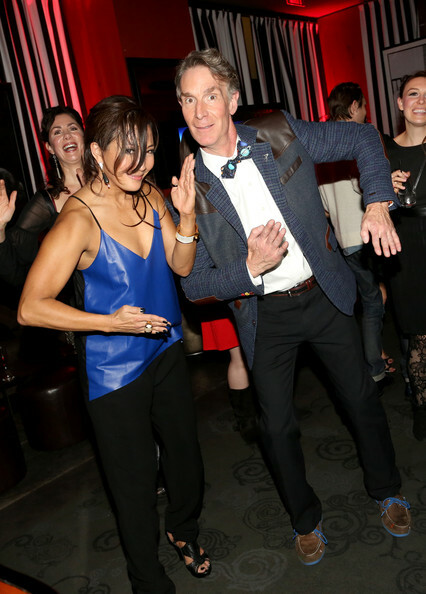 And here she is at the Dancing With The Stars wrap party with Bill Nye after the show. Pic courtesy of Zimbio Pictures. Happy Thanksgiving Day, All!! Below is Afterbuzz TV with their new Dancing With The Stars Season 17 finale addition to take in when you have time today. They admit how they were wrong and right about who would win. Though as I just wrote at Pure Derek Hough, when the subject is brought up in the beginning, Anna says it was easier to do a Charleston than a Ballroom dance, but, Tristan MacManus disagrees (Yay Tristan! I agree for how it wasn’t easier for Amber!). More below. Let us know what you think! And below is the Good Morning America “After party” coverage with our Champs and finalists!! Note that Karina Smirnoff didn’t come. GMA announced she had a family emergency. Let’s hope everything is ok. Our thoughts and prayers are with her. Also, be watching THIS LINK at the View. They should be posting their new interviews with the finalists a little later today. ETA: Entertainment Weekly interviewed some of the cast after the finale last night. You can see them talking on their favorite moments in a video HERE. ETA2: And below are the couples being interviewed by Tony and Leah.